Frequently direct measurement of proteins or their phosphorylation in intact cells is not possible, for instance, when cells are too few, frozen, or subject to degradation. We have demonstrated that tumor cells pour their DNA, RNA, and protein content into circulation because of turnover and breakdown of cell structures. Proteins in solution most likely circulate as complexes, which protects them from degradation. We describe a cell-free, bead-based method that takes advantage of this phenomenon. Our approach is based on immunoprecipitation of the protein of interest on the surface of beads, followed by detection of the protein or its modification (phosphorylation) using a secondary antibody labeled with phycoerythrin at a 1:1 ratio. Fms-like tyrosine kinase-3, which is mutated in majority of cases of acute myeloid leukemia, is used as an example. This method could be applied to the quantitation of several other proteins without the need for intact cells. Key Words: Proteins; phosphorylation; soluble; plasma; beads; FLT3; AML; MDS. The direct measurement of proteins and their phosphorylation in intact cells has been limited by the availability of viable cells. Proteins have been observed in plasma not as free or soluble moieties, but as circulating complexes (1,2). In the following sections, we will describe the measurement of total and phospho-rylated protein levels in plasma by flow cytometry, using Fms-like tyrosine kinase-3 (FLT3) as an example. FLT3 is a class III receptor tyrosine kinase that plays a pivotal role in survival, proliferation, and differentiation of hemato-poietic progenitor cells. Somatic mutation of the FLT3 gene in the form of an internal tandem duplication or point mutation (D835) in the coding sequence of the juxtamembrane domain has been observed in acute myeloid leukemia and myelodysplastic syndrome (3-6). These mutations activate FLT3 in a ligand-independent manner, leading to constitutive phosphorylation of downstream signal transducers. 1. Flow phosphate-buffered saline (PBS): prepare with 5.6 g sodium dibasic, 35.48 g sodium chloride, 2.8 g bovine serum albumin (BSA), and 4.0 g sodium azide. Add deionized water to 4 L; adjust pH to 7.4. 2. Carboxylated polystyrene beads (Bangs Laboratories, Fishers, IN). 3. Carbodiimide (Sigma Aldrich, St. Louis, MO). 4. Anti-human FLT3 antibody (R&D Systems, Minneapolis, MN). 5. Phycoerythrin (PE)-labeled anti-FLT3 (CD135) (BD Biosciences, San Jose CA). 6. PE-labeled anti-phosphotyrosine antibody (BD Biosciences). 7. Sorvall cell-washer 2 (Thermo Electron Corporation, Ashville, NC). 1. FACSCalibur™ flow cytometer (BD Biosciences). 2. QuantiBRITE™ PE beads (BD Biosciences). 3. Cell Quest Pro acquisition and analysis software (BD Biosciences). 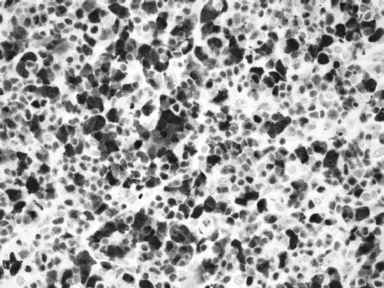 Our approach uses polystyrene beads coated with anti-FLT3 to capture circulating FLT3 protein in plasma. The captured FLT3 protein on the surface of the beads is quantified using either a secondary PE-labeled anti-FLT3 antibody or a secondary PE-labeled anti-phosphotyrosine antibody. Fluorescence is detected using flow cytometry and compared against a PE standard established with QuantiBRITE PE beads (see Note 1). This converts mean fluorescence intensities (MFI) into antibodies bound/bead. 1. The cytometer is calibrated prior to use according to the manufacturer's protocol using CaliBRITE 3 beads (BD Biosciences) with addition of APC-beads (BD Biosciences). 2. The FACSCalibur flow cytometer is prepared for acquisition by launching Cell Quest Pro software (BD Bioscience). It is recommended to check sheath fluid and waste levels prior to acquisition. The appropriate acquisition template and instrument settings are selected. 3. Standardization is performed before acquisition of samples using QuantiBRITE PE beads, which are reconstituted with 1 mL of flow PBS. Five thousand events are acquired on the FACSCalibur. An example of the results is shown in Fig. 1. Fig. 1. Schematic representing bead conjugation, immunoprecipitation, and detection of protein to measure targeted protein in plasma by flow cytometry. 1. Anti-human FLT3 antibody is conjugated onto beads with the following steps. a. 100 pL of 7.37 pM polystyrene beads (Bangs Laboratories) are washed twice and diluted 1:10 with 0.05 M sodium bicarbonate. b. Beads are incubated in the presence of 0.01 g carbodiimide (Sigma Aldrich) for 30 min with mixing at room temperature. c. Beads are washed and resuspended in 1 mL 0.05 M sodium bicarbonate. d. 100 pL of beads are removed for beads check (see Note 2). e. The remaining 900 pL of beads are incubated with 100 pL anti-human FLT3 (R&D Systems) overnight at 4°C with mixing. 1. Beads are washed and resuspended in 1x PBS/5% BSA. 2. Lysate and plasma samples are diluted 1:20 and 1:10, respectively. 3. Samples are incubated with 5 pL 10% sodium dodecyl sulfate and denatured at 96°C for 5 min. 4. After cooling on ice, the samples are transferred to new tubes and incubated with 30 pL anti-FLT3-conjugated beads for 4 h at room temperature with mixing. 5. After being washed and resuspended in 1x PBS/5% BSA, beads are aliquoted into four tubes and incubated separately with 5 pL rabbit anti-phosphotyrosine (Zymed/Invitrogen, Carlsbad CA), IgG1 PE, or anti-human CD135 PE (BD Biosciences) (see Note 3). 6. After incubation for 1 h with mixing at room temperature, beads are washed and resuspended in 1x PBS/5% BSA. 7. Beads with rabbit anti-phosphotyrosine are then incubated with the appropriate secondary antibody (bovine anti-rabbit PE) for 1 h at room temperature, in the dark with mixing. Fig. 2. Dot plots representing cells stained with FLT3 antibody and phosphorylated FLT3 antibody. An upward shift in FL2 (x-axis) represents detection of the antibody of interest. 8. Beads are washed and resuspended in 500 p,L flow PBS for analysis on the FACSCalibur. An example of the result is shown in Fig. 2. This flow cytometry approach is based on immunoprecipitation of the protein of interest onto the surface of beads, followed by detection of the protein or its modification (phosphorylation) using a secondary antibody labeled with PE at a 1:1 ratio. This method could be applied to the quantitation of several other proteins without the need for intact cells. Measuring levels of total and phosphorylated FLT3 protein provides important information that may not be gleaned by analyzing only internal tandem duplication and D835 mutations. The use of plasma, rather than cells, provides the advantages of more sensitive detection, as plasma is highly enriched with the DNA, RNA, and protein content of leukemic cells. The specificity of antibodies should be validated using cell lines and ex vivo studies to manipulate the protein. This approach generates quantitative data on proteins and their modification without the need for intact cells (see Note 4). 1. QuantiBRITE PE beads are four different beads labeled with known amounts of PE antibody. These beads are acquired during every experiment and used as a fluorescence standard to covert MFI to antibody binding capacity (ABC). 2. It is preferable that the conjugation be confirmed by performing a detection step with anti-mouse PE. The conjugation is detected by incubation of diluted conjugated beads (1:10 with blocking buffer) with 5 p,L anti-mouse PE for 15 min at room temperature in the dark. The beads are washed and resuspended in 500 ^L flow PBS for flow analysis. 3. Though anti-phosphotyrosine detects all tyrosine kinases, only FLT3 kinase is present after immuno-precipitation with anti-human FLT3 conjugated beads. The IgG1 PE is used as the isotype control. 4. As flow cytometry output can be in terms of percentage positivity and MFI, it is recommended to analyze data in terms of a derived "index value," which combines both factors. Index = (percentage positivity) X ABC. 1 Albitar, M., Do, K. A., Johnson, M. M., et al. (2004) Free circulating soluble CD52 as a tumor marker in chronic lymphocytic leukemia and its implication in therapy with anti-CD52 antibodies. Cancer 101, 999-1008. 2 Rogers, A., Joe, Y., Manshouri, T., et al. (2004) Relative increase in leukemia-specific DNA in peripheral blood plasma from patients with acute myeloid leukemia and myelodysplasia. Blood 103, 2799-2801. 3 Kioyi, H., Towatari, M., Yokota, S., et al. (1998) Internal tandem duplication of the FLT3 gene is a novel modality of elongation mutation which causes constitutive activation of the product. Leukemia 12, 1333-1337. 4 Fenski, R., Flesch, K., Serve, S., et al. (2000) Constitutive activation of FLT3 in acute myeloid leukaemia and its consequences for growth in 32D cells. Br. J. Haematol. 108, 322-330. 5 Nakao, M., Yokota, S., Iwai, T., et al. (1996) Internal tandem duplication of the FLT3 gene found in acute myeloid leukemia. Leukemia 10, 1911-1918. 6 Rombouts, W., Blokland, I., Lowenberg, B., and Plemacher, R. (2000) Biological characteristics and prognosis of adult acute myeloid leukemia with internal tandem duplications in the FLT3 gene. Leukemia 14, 675-683.